Sweet Poha recipe is a simple, easy to make, quick and tasty dish among Indian festival foods. 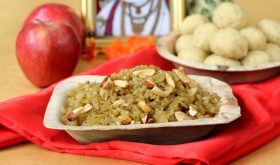 There are very few simple sweet dishes recipes that do not require elaborate preparation and today’s Sweet Poha falls in that category. 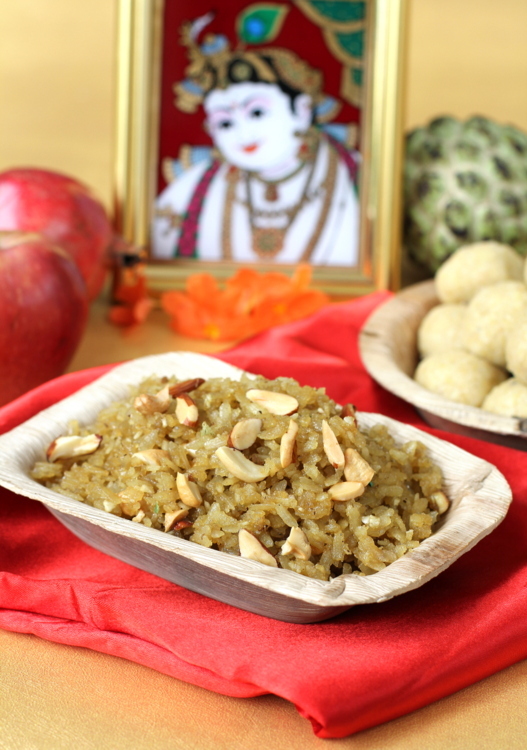 It is popular in most parts of the country under different names – teppi atukulu, meetha poha, godaso pou, goda phovu, vella aval and sihi avalakki. Beaten rice and jaggery are the essential ingredients while dried coconut powder and cardamom are the flavor enhancers and roasted nuts provide a divine nutty touch. It is believed to be a favorite of Lord Krishna and is an integral part of naivedhyam (prasad) offerings during Janmashtami. Its a favorite in our home especially as a quick evening snack when sweet cravings come to the fore. Wash the beaten rice/poha well and drain. Sprinkle 2 tbsps of water over the beaten rice and keep aside for 10 mts. Heat a small pan with ghee, add the broken cashew nuts and almonds and roast them to a golden brown and turn off flame. Pour the nuts along with left over ghee to a small bowl. Add dry coconut powder and cardamom powder to the bowl and keep aside. Heat 1/2 cup water, add the grated jaggery, allow it to melt and bring to a boil. Reduce to low flame and cook the jaggery to softball consistency, apporx 8-10 mts. When you place a little jaggery syrup in a cup of water, it will form a soft ball. Turn off flame at this stage. Add the drained beaten rice to the dry coconut-roasted nuts mixture and mix well. Add this mixture to the jaggery syrup and mix well such that the contents are well combined. Remove to a serving bowl and serve garnish with roasted nuts. If you do not have dry coconut powder, use fresh grated coconut. By Sailu Published: August 28, 2013 Sweet poha recipe is the most easy to make among simple sweet dishes recipes for Indian festivals special food especially Janmashtami or Krishan Jayanthi. Made this as a Janmashtami offering today!! Thanks for the recipe 🙂 One question….there is a smell in the atakullu even after soaking and cooking. Is that normal? Or did i not soak properly? Omg, wat a fabulous prasadhams..Looks great..
Are these thick poha or thin ones? I make similar dish with thin poha…Next time will try this recipe with thick poha. Wonderful clicks!